46,2 x 30,4 cm - 18 3/16 x 11 15/16 in. 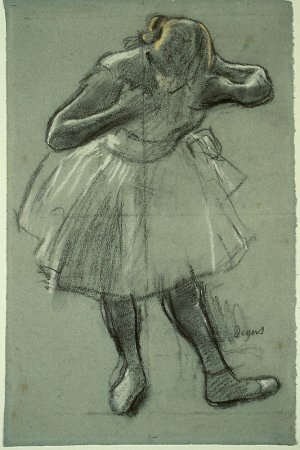 Atelier Degas - Vente Degas, 1918, I, n° 376 (repr.) - Joseph Hessel, Paris, avril 1920 - M. et Mme Martin Ryerson, Chicago, circa 1921 - The Art Institute of Chicago, 1933 (Don M. et Mme Martin Ryerson). Minneapolis, Institute of Arts, 1922, Exhibition of Modern Paintings - The Art Institute of Chicago, 1933, cat. 862, p. 90 - The Art Institute of Chicago, 1946, cat. 12, pl. XV - Washington, The Phillips Collection, 1947, cat. 12 - New York, Wildenstein & Co., 1963, cat. 104 - La Nouvelle Orléans, Isaac Delgado Museum, 1965, cat. 6 (repr.) - Northampton, Smith College Museum of Art, 1979, cat. 17 (repr.) - The Art Institute of Chicago, 1984, cat. 25, p. 61-62 (repr.) - Londres, Royal Academy, 2011, cat. 41, p. 116-117. Manson, 1927, Works by Edgar Degas, cité p. 47 - Browse, , n° 191, p. 398 - Johnson, 1975, p. 46-47 - Harold, Haller Olsen, 1979, n° 2F11, p. 43 - Brooke, 1996, p. 147 (repr.) - Boggs, 1996, p. 46, 93 (repr.) et p. 109, pl. 22 - Brooke, 2002, p. 8 (repr.) - Wenzel, Adventures in Art : Degas-Zauber des Tanzes, 2002 - Kendall, DeVonyar, cat. exp. Royal Academy, Londres, 2011, cat. 41, p. 116-117 (repr. ).